After creeping through Texas last night, across ice as thick a plank of wood, we finally stopped for the night just east of Dallas. This morning, we got up bright and early to get a jump on the day. Well, one cup of coffee and one hour later, traffic came to a screeching halt on Interstate 20. So screeching, that Ed had to skillfully stop in order not to run into the big orange pumpkin (Schneider) who abruptly stopped right in front of us. I actually don't know why this guy stopped so short, because as you can see there is nothing in front of him. Maybe he got scared. Ahead of him, there were miles and miles of traffic with no end in sight, and no one on the CB seemed to know why everything was at a stand-still. Was it an accident? Was it icy road conditions? Chatter on the radio was producing no solid information. It didn't really matter, I guess, because we had bigger problems; we were now stuck in the shoulder snow. Since big orange stopped so abruptly, Ed moved a little to the left to be sure he wouldn't hit him were someone to slam into us. That's how quickly it all happened. But when Ed did that, he didn't realize that the tires on the left side of the tractor were a little off the pavement and quite a bit on the snow of the shoulder. When Ed tried to move, everything just kept spinning. We weren't moving. He rocked the truck back and forth, trying to get us out, but nothing. Then some guys on the CB offered to help pull him back up onto the pavement, so he got out and three other truckers gathered around to put their heads together to find the best solution. They started by chaining us to the guy behind us and pulling us backwards. It took a few tries for them to realize that wasn't going to work. The way our wheels were turned, we just couldn't get a good enough grasp on the roadway. So they dragged the chain to the front, hooked up to the guy in front of us, and tried again. "Pull, pull, pull. Keep going. Go, go, go, go, go." I heard Ed saying over the CB, telling the guy who was doing the pulling not to stop. We were almost there. I felt traction. Then finally, the tires gripped and we were on pavement again. Whew! I think if we were heavier, we probably could have gotten out without the assistance, but we were only loaded with 2,000 pounds and that just wasn't enough to get us going. 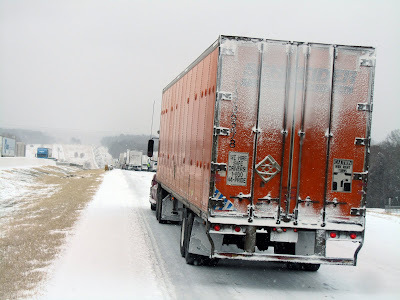 I'm really thankful these other truckers were so willing to help us out. When we were finally back on the pavement, Ed told the guys if they were hungry to let us know, we had a full kitchen, he'd be happy to make them something. HE would be happy to make them something? Helloooooo. Turns out they didn't need anything, but really, if they did I would have been happy to oblige. They saved us a hefty tow bill by helping us out. We wound up sitting on the interstate for over THREE hours. And when we did finally get going, not everyone could move. One guy was stuck spinning in the ice on the bridge in front of us, none of his tires grabbing. We tried to help him, but the surface was so icy, we couldn't even back up close enough to him to help tow him out. I felt bad just leaving him there, especially after someone helped us, but we didn't have a choice. Maybe someone else would come along and give him a hand so he too could avoid a hefty tow bill. You always have to pay it forward, because you never know when the time will come again that you'll need someone's help. We were all in that jam together and our fellow drivers helped us out when we were in need. It felt like what I've heard the old days were like, where the brotherhood of truckers looked out for each other and helped each other without questions. We need to keep that attitude front and center, helping out wherever and whenever we can, because you can't get anywhere in life if you're stuck spinning your wheels. Try it again. Very good motto!!! Fascinating. Agree re paying it forward. Very glad to see you cavorting with Q Tips, thus know you made it through safe and sound. 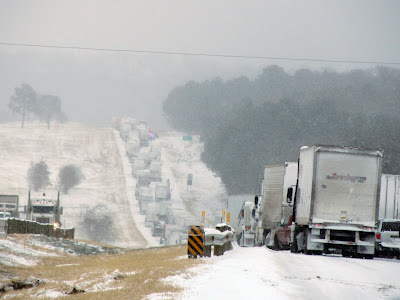 I was in the Dallas area the same time--it was NASTY driving conditions! Glad you got out okay. And I Thought My Feet Were Big! Waiter! There's A Beer In My Soup!